We consider addressing environmental issues to be our corporate responsibility, therefore it is an important management objective for the company. We established the Group’s Environmental Policy in 1996 and our environmental management vision entitled "Green Omron 21" in 2002. Based on this policy and vision, we have promoted environmental management practices centered on lessening the negative impact of our business activities on the environment. Efforts were mainly concentrated on reducing total CO2 emissions and amount of waste associated with business activities in Japan. With our Group’s new "Green Omron 2020" vision, we are determined to create and supply products and services that help reduce environmental loads, keeping in line with our core value of "working for the benefit of society." By doing so, we aim to further advance environmental management in order to contribute to creating a sustainable resource-recycled society. 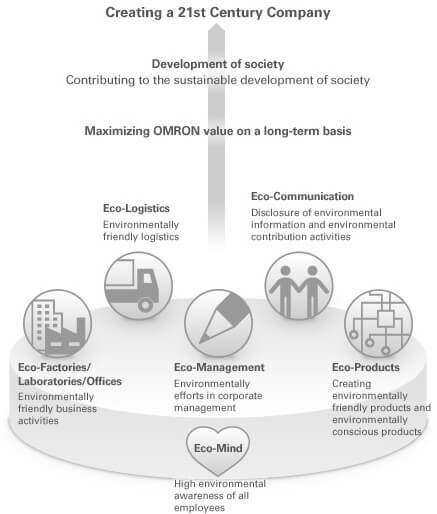 You can find more information about Omron's Sustainability on our global website.